One of the things I love about working with men’s grooming products is their ability to transform the way we look. Not in a drastic surgical kind of way, but the way you can use products to positively ‘groom’ your appearance. It can be something simple like a professional hair product, or just a good moisturiser that can leave you looking and feeling one hundred times sharper. But these transformations are never more apparent than when you’re trying to solve a specific problem – that’s where grooming products can really transform your look and have a huge impact on your confidence. As guys we’re natural problem solvers, but we do sometimes need a helping hand and a bit of encouragement when it comes to more embarrassing grooming issues. The great thing about shopping for grooming products online is that you reduce that embarrassment factor of talking to someone face to face, and can get straight to the solution. To help you find exactly what you need, I’ve highlighted five of the most common grooming problems and the products proven to combat them. As grooming problems go, acne-prone skin is probably considered the biggest one. Millions of guys struggle with acne and spots from their teens and right through to their adult years, and it’s certainly something that has the potential to dictate your confidence levels. Severe acne can also leave a lasting effect on your skin in terms of scarring. I’m sure many of you will have struggled to get a handle on acne-prone skin at some point, and will have tried lots of different products, lifestyle changes or even prescription medication. But there is one product range that I have championed time and time again that’s been shown to dramatically reduce the appearance of acne and heal acne scarring: the Murad Blemish Control range. 92 per cent of users notice a reduction in blemishes in as little as three days. The brand currently has three million users worldwide. In the same way you get dry skin on your face, you can also get dry skin on your scalp – known as dandruff to you and me. If the natural cycle of skin renewal is out of sorts and happening quicker than normal, patches of dry and flaky skin can come away from your scalp and settle in your hair, causing a rather embarrassing problem. In extreme cases you may even be put off wearing dark clothing because of the flakes, and you can forget about feeling comfortable if someone’s running their fingers through your hair. Luckily for dandruff sufferers, there’s a doctor in the house. No, not Dr Christian of Embarrassing Bodies fame, but the Hair Doctor – Philip Kingsley. A hair care innovator, he recognised the need to bridge the gap between science and hairdressing as well as providing solutions for the most extreme hair and scalp problems. The second big hair problem is something that the majority of men will fear as they get older: thinning hair. Whether it’s because you’re slowly losing your hair to hereditary baldness, have naturally thin locks, or are thinning because of stress or another medical condition, losing your hair can have a big effect on a guy’s self esteem. But rather than get down in the dumps about hair loss, take a positive step and invest in products that are going to give your hair the nutrition it needs to not only survive, but prosper too. The Kérastase Specifique Stimuliste range is used in salons to create the optimum environment for hair growth, energising your hair and delivering essential active ingredients to the roots. It should be noted that there is currently no ‘cure’ for hair loss. The products recommended today will simply give your hair the very best chance to grow, and therefore hopefully extend the hair’s life cycle, by promoting a healthy environment (read: scalp). If hair loss is a true concern for you and severely affecting your confidence, try making an appointment with your local GP/doctor – there are products on the market that can actually encourage hair growth, such as minoxidil (what you find in products like Regaine) and Finasteride/Proscar. However, these all come with potential side effects and are not proven to work for everyone, so you should do thorough research before even considering options such as this. You may think that stretch marks are reserved for pregnant women, but guys can suffer from this type of skin scarring too. Whether you’ve packed on muscle quickly (I wish), had a growth spurt, or you’re carrying a few extra pounds, rapid growth can often result in the occurrence of stretch marks. Areas prone to skin stretching are the stomach, back, thighs, hips and upper arms, and like all the other problems in this article, can cause you to feel less confident in your appearance. A common ailment for those new to shaving, redness and irritation can put you off this daily routine all together. When razor burn strikes it can be painful and unsightly, and I certainly struggled with it until I was introduced to a better technique and superior products. That better technique comes in the form of shaving in the direction of hair growth rather than against. This generally means downwards on your face and over your jaw line, and upwards on the lower part of your neck. If you’re unsure, run your fingers over your stubble and you’ll soon get a good understanding. 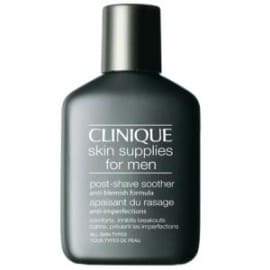 Lastly, your post shave products have the most important job of all – to put lost moisture back in to your skin, calming, soothing and keeping any redness to an absolute minimum. Got a grooming problem you would like help with? 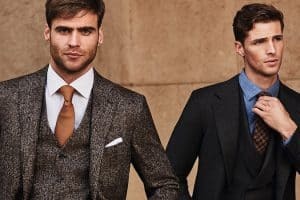 Leave a comment below and maybe the FashionBeans community will have a solution.